With the scope and intricacy of all these demands in mind, the independent research firm TechValidate decided to survey a group of PrinterLogic government customers (TVID: 487-1D2-1AC) on one crucial aspect common to all their print environments—that is, speed of deployment when migrating to PrinterLogic as their new print management solution. The question TechValidate put to them was this: How many days of dedicated time did it take to get the solution installed? An impressive 65% of the organizations surveyed reported that they had fully installed PrinterLogic in under five days. Of that number, 30% stated that they completely installed PrinterLogic throughout their organization in less than 24 hours. What’s even more impressive is that a staggering 80% of these governmental organizations deployed PrinterLogic in ten days or less. 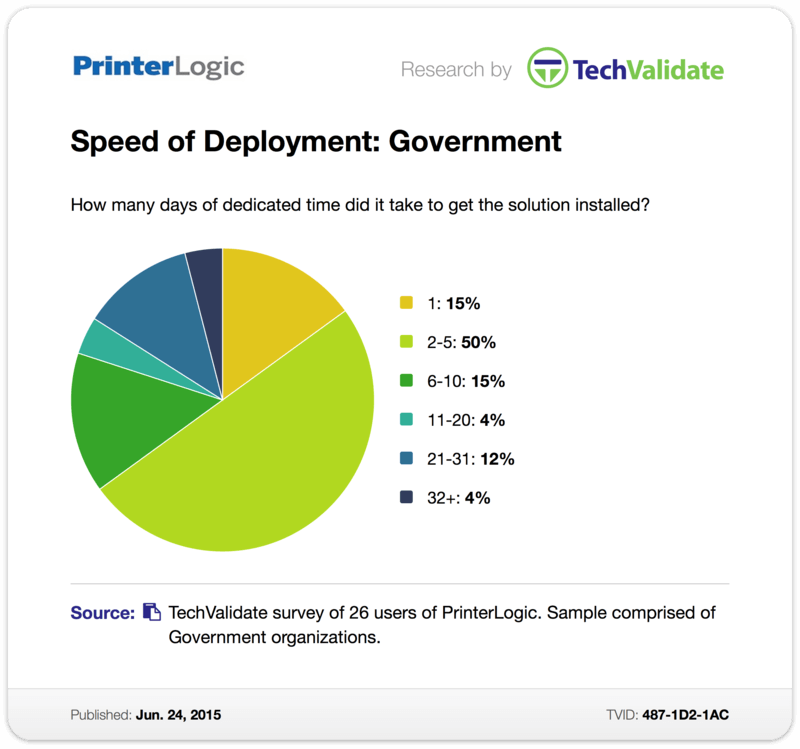 That lightning-quick speed of deployment is almost unheard of for enterprise print management solutions, especially when you keep in mind that this survey took governmental organizations of all shapes and sizes into account—including those with hundreds of networked printers to migrate, not to mention dozens of print servers to be eliminated. The thing about such rapid real-world speed of deployment is that it shows these governmental organizations were able to transition to a simpler, more powerful, more centralized, and more cost-effective print management solution in practically no time at all. That meant less time spent in the inefficient limbo between two enterprise-level printing solutions, and more time experiencing the benefits of PrinterLogic, such as comprehensive auditing, rock-solid reliability, effortless printer deployment, and easy management of printers, drivers and queues. We don’t always associate government with speed, but thanks to PrinterLogic, organizations like these are proving stereotypes wrong. PrinterLogic’s amazing speed of deployment is just the first swift step on their way to a more cost-effective, productivity-enhancing print environment.